Hey y’all! It’s still January. It’s still cold out. I’m dreaming of warmer weather and sunshine. In the meantime, I’m still cooking my lil heart away in the kitchen dreaming up lots delicious goodies to put on this here blog. To me, January is a perfect time to get back on track with everything in life: organization, weight loss, working out, cleaning out the closet, whatever it is that you’ve put off for months and months after pumpkin spice season hit. I feel like once that season hits…. we kind of all forget about the real world, okay maybe not everyone, maybe just me. Anyhow, It’s a brand new year. a fresh start. a blank slate. It always makes me hopeful and it always makes me want to start taking care of myself a bit better. 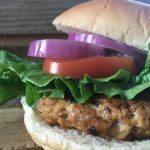 I think these Bacon Balsamic Turkey Burgers are the perfect little things to help me (and you!) kick off this new start. Anyhow, These are pretty dang delicious. I’ve had them for precisely three meals in a row now and I’m not tired of them. Not even a little. And I really think you’ll enjoy these too! I’m going to show you how to do the skillet to oven method today because that’s my favorite method. Also, truth be told, I don’t know how to grill. We charcoal grill so, I’m still working on my technique. Side note: I’ve been working on my technique for about 10 years…. I leave the grilling to Eric and before him, my Dad was the grill master. I personally feel like I have no control over the temperature and it drives me a little nuts. I will list the things I have mastered on the grill for y’all. 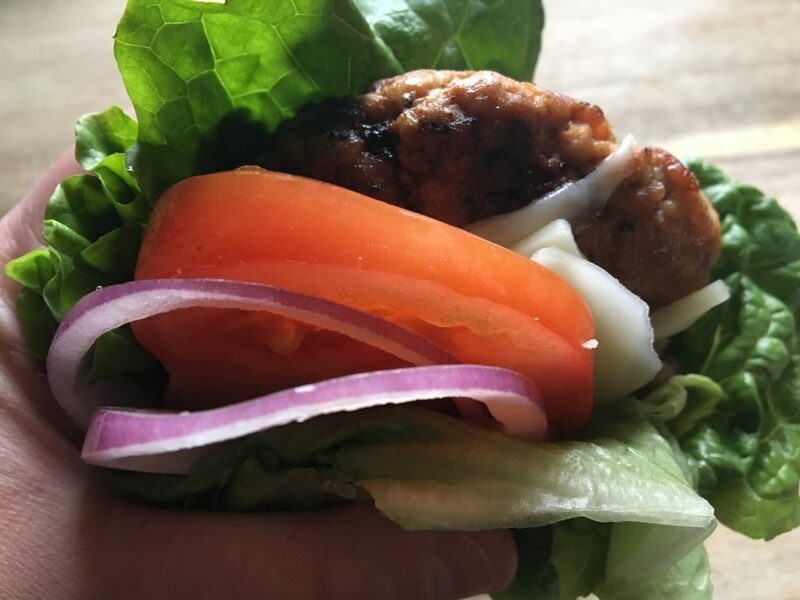 About these burgers, They are delicious and insanely low in calories and weight watcher points. So for y’all looking to lose a little of the extra jiggle. (Lord knows I am) These are going to make your belly and waist super happy! I enjoyed quite literally all of the oven baked french fries next to these babies.. because life is about balance, dontcha know? 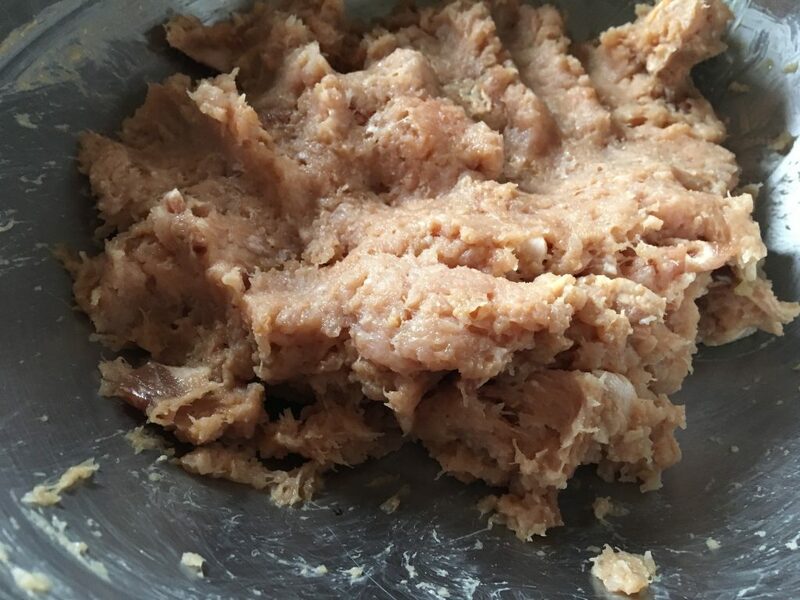 Throw two pounds of Jennie O Extra Lean Ground Turkey in a large bowl. Also throw some chopped bacon… because it’s the right thing to do. Ahem, when working with super lean meat and you want to make a burger patty. It needs a little fat Enter: Bacon. This is where the recipe gets fun. I’m always trying new things. 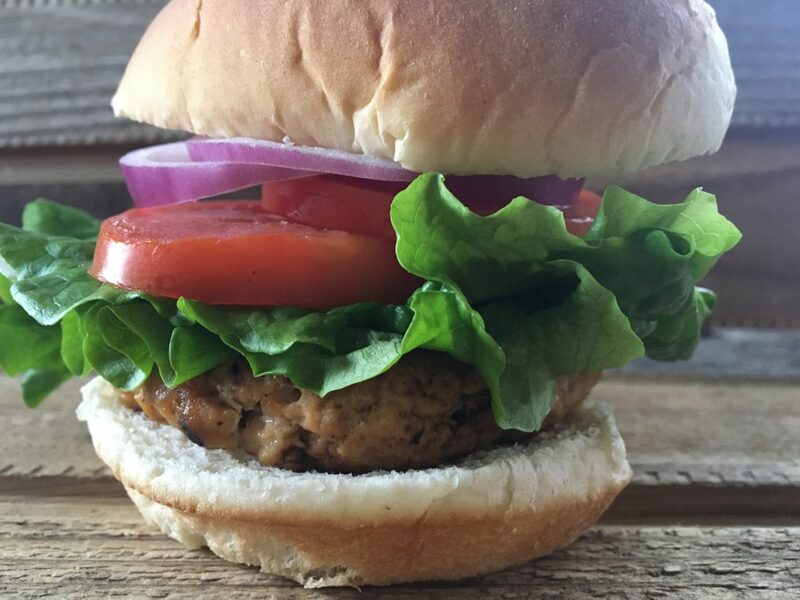 The world is your oyster turkey burger. No really though, these ingredients have been my super tried a true ones. So I’ll share these ones for now. 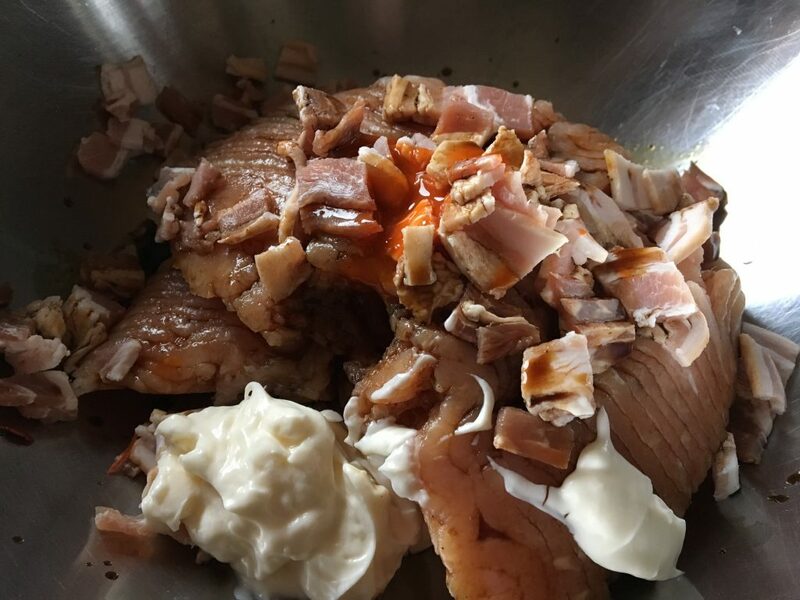 Add a little of this a little of that.. light mayo, a few or five dashes of hot sauce, 2 tsp of balsamic vinegar, and a few tsp of Worcestershire Sauce! They mayo will be your binder basically so that the burger does not break up while cooking. You either love this or hate this. I don’t mind this, but I hate this when precisely 1.3 seconds of mashing has gone by and my baby girl starts screaming from the other room. What was wrong you ask? Why, She put herself into a laundry basket and didn’t know how to get out of it! Okay… Wash your hands and get in there. Mash up the meat real good with your hands to make sure you incorporate all of the ingredients into each burger patty. Form 7- 4 1/2 ounce burger patties and lay on a plate or cutting board. I’m kind of generous with the salt here. You don’t have to be. 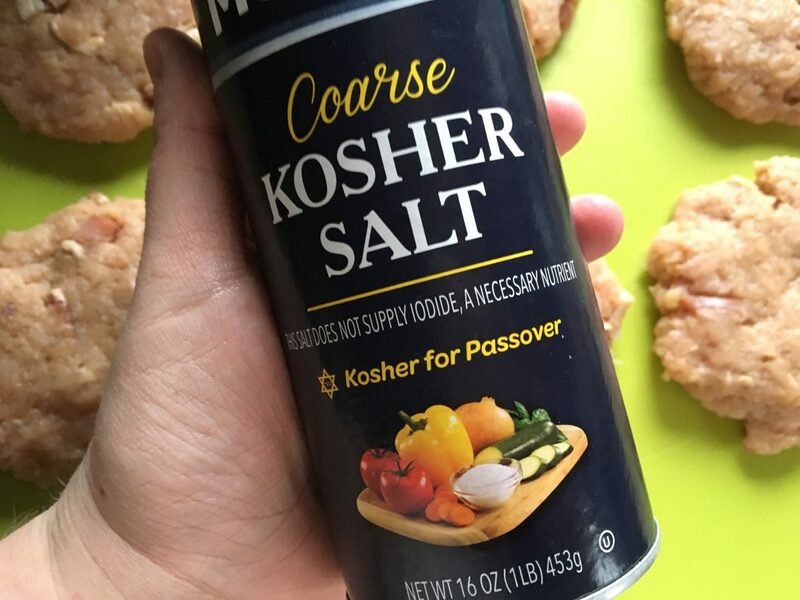 If you can, use Kosher salt. 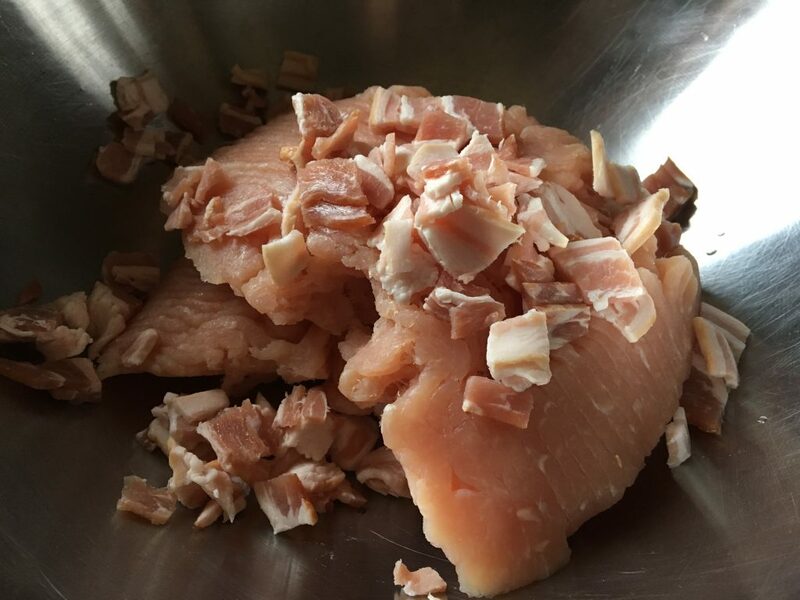 The flakes of salt adhere much better to the meat rather than regular salt. Salt and Pepper one side of each patty. Lightly spray the pan with a bit of cooking spray. I used canola oil here. Throw’m salt n’ pepper side down in a large fry pan lightly spraying with a bit of cooking spray over medium-high heat. On the side that is right side up salt n’ pepper it! Drizzle a bit of balsamic vinegar on one side of each patty. Brown on each side for 2 minutes. and then you’ll have this. Oh my gosh. It looks like it came off the grill! (It didn’t, I promise.) What you see is exactly what I did and It’s exactly what I eat. It’s moist, flavorful, and just perfect! Grab some burger fixin’s. Whatever you fancy. 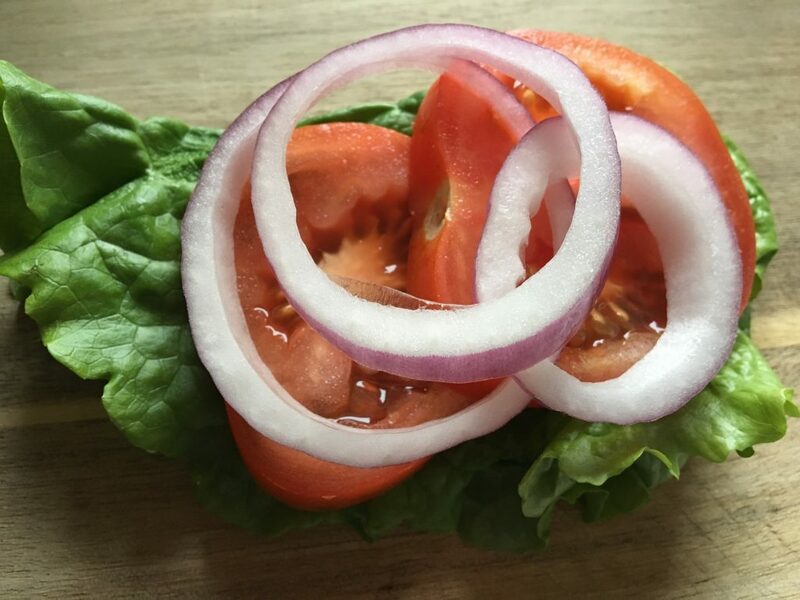 In this house, we prefer the onion, tomato, and lettuce trifecta. Grab a bun! These ones are reduced calorie made with whole grains. 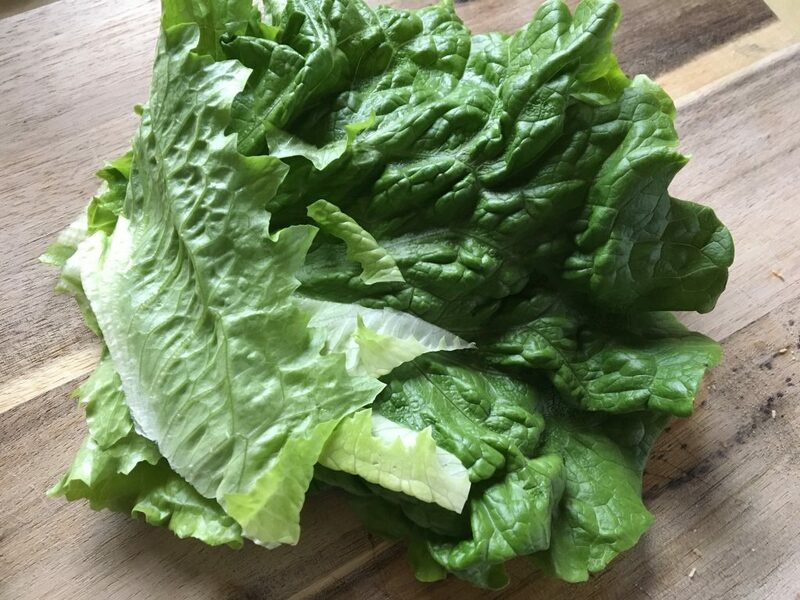 Or, make yourself a lettuce wrapped burger! and if you’re like me, add cheese!! Mozzarella compliments this burger quite perfectly. This afternoon I went to photograph these burgers because I kept forgetting to do a finished photograph. I had no intentions of eating this until later or tomorrow, but I couldn’t resist. 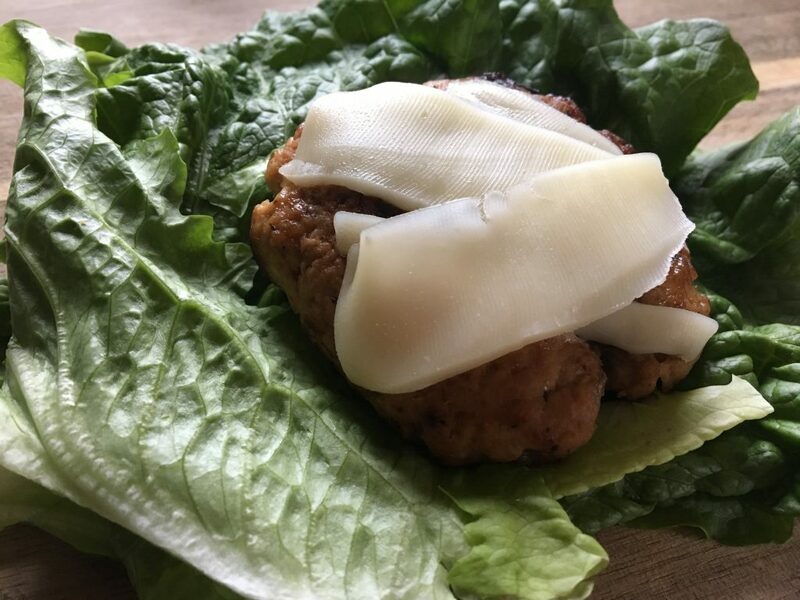 Every part of this lettuce wrapped burger is pretty much perfect and that’s saying a lot because bread pretty much is my world. I love how fresh it tastes. It reminds me of Spring! Spring? Where are you? Come back to mama. Pretty please? And here’s both of them, just hangin’ out, ready to be eaten! Get cooking! and make sure to Let me know how it goes! P.S. This recipe can easily be halved if you’d rather just use 1 lb of meat. P.P.S. We just like to eat in this house. P.P.P.S. I will edit this post when I see how the couple that I threw in the freezer turn out. Preheat oven to 375 degrees. In a large bowl add the first 6 ingredients. With clean hands, mash together the ingredients until thoroughly combined. Form 7 4-1/2 ounce patties and lay on a cutting board. Salt and Pepper one side of patty. 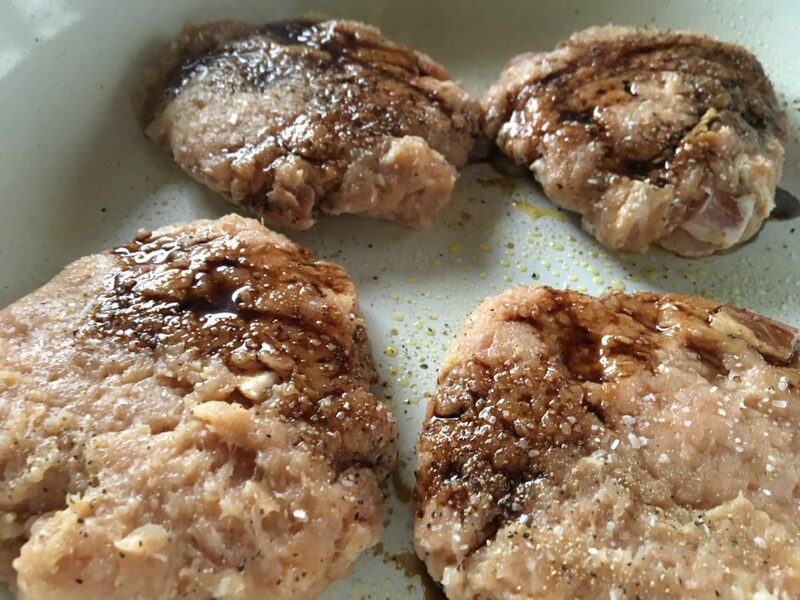 In a large frying pan over medium high heat, lightly spray with cooking spray, place the patty salt & pepper'd side down. On the side that is upright add salt & pepper then drizzle lightly with balsamic vinegar. Cook on each side for about 2 minutes. Repeat for all patties. 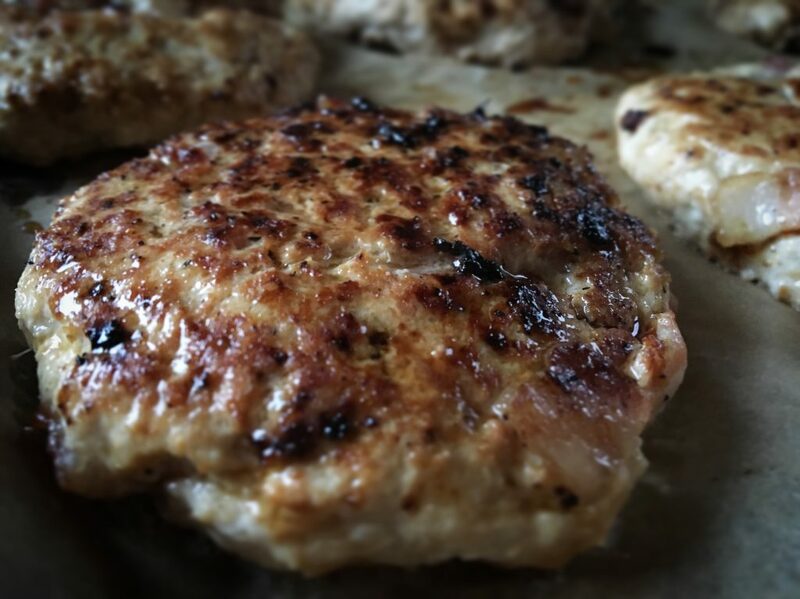 Place patties on a sheet pan and then into the oven for about 8 minutes or until the a meat thermometer reads 160 degrees. 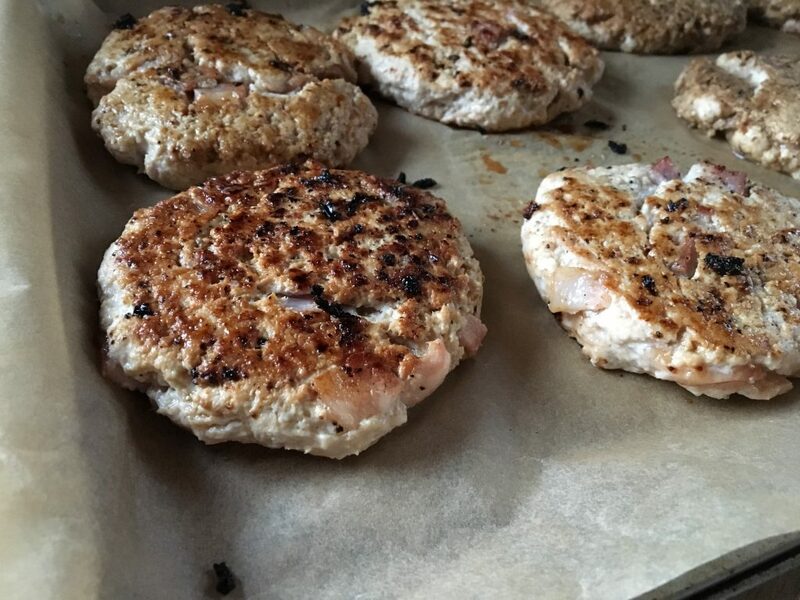 Remove from oven and let the burgers rest for a few minutes to finish cooking without over cooking. 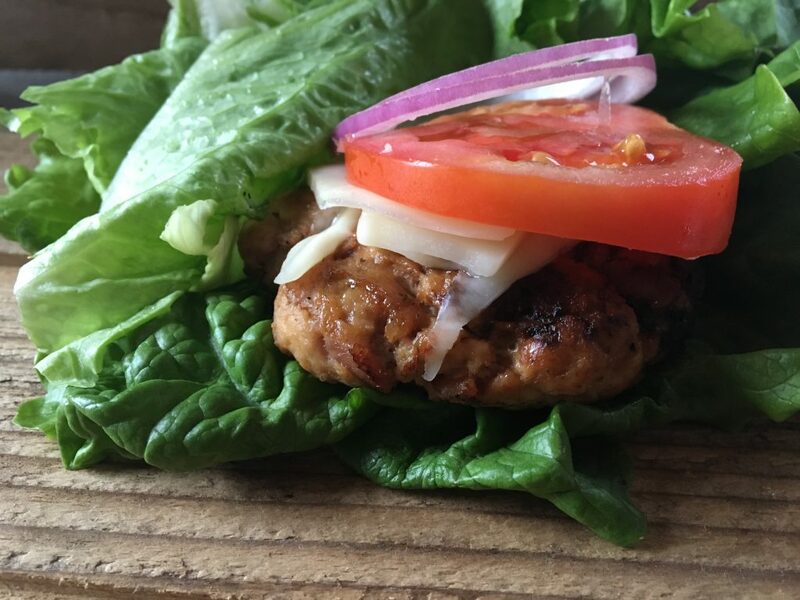 Assemble your burgers however you like'm on a bun or in a lettuce wrap. Serve and enjoy! I just had a leftover of this burger from dinner last night. I made a wrap- ole wellness wrap, laughing cow pepper jack, pickles, bbq sauce and arugula. Made. My. Day. So filling, so delicious! Thank you for another hit recipe! These look amazing! 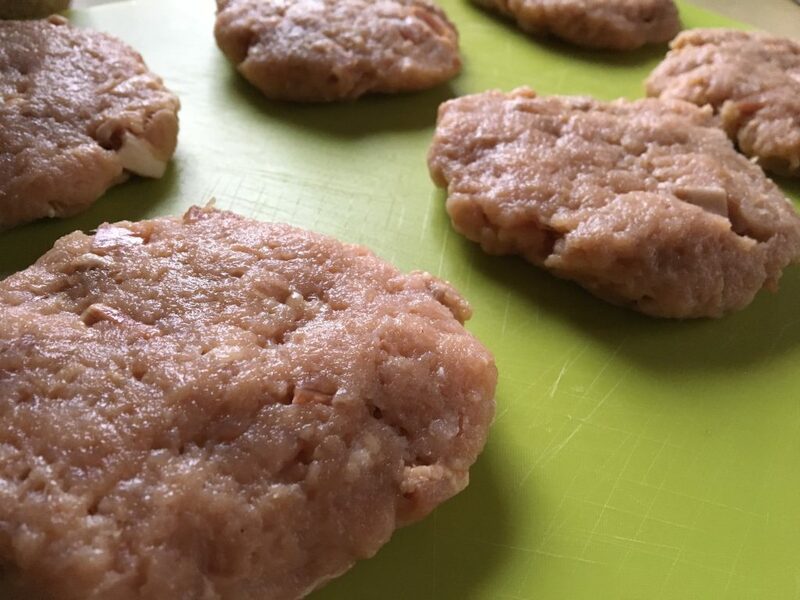 Has anyone tried making the burger patties and then freezing before cooking? Did that effect the texture or taste? OMG…these were sooooooo delicious! We just had these for dinner with the loaded potato bites my husband and my grand daughter loved them. Very flavorful. And yah me, leftovers too. so happy you enjoyed them! I have been craving these again lately. I need to make them soon! Star…I LOVE these!! I totally forgot I was even eating turkey. My boyfriend loved them too–he had two! Any additional tips on how to make sure they don’t fall apart in the pan while browning them? That was my only problem. Thank you! Hi! Thank you so much for sharing your delicious recipes with us! I am dying to try these! However, my husband is completely opposed to ground turkey 🙁 Do you think the mayo, bacon, and balsamic vinegar would work just as well with lean ground beef? Thanks!! Hi Lara! It would totally taste delicious with lean ground beef! 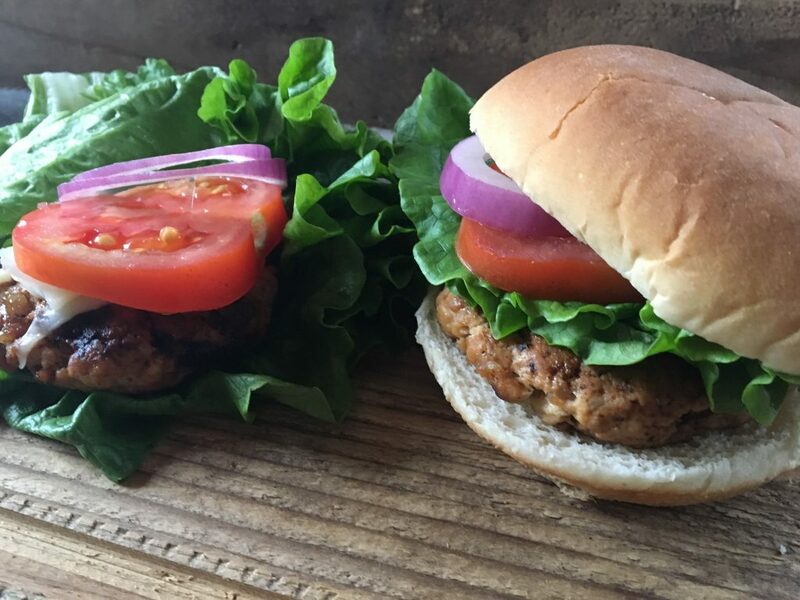 I add a little mayo OR olive oil to any burgers I grill with lean protein to help them stay juicy and together! What is drizzled on top of the raw burgers in the pictures? Making these tonight! These look delicious! What kind of hamburger buns do you use? I’m on WW and can’t seem to find reduced calorie hamburger or hot dog buns anywhere (live in Northern Virginia) and it’s driving me crazy! Thanks so much. I use a store brand from Jewel Osco. (Signature Farms) I also use Healthy Life Brand (found at walmart) from time to time! Yes girl these look awesome! OMG I love a burned hot dog too hahaha! You have such creative lean recipes , love it !